I just finished the book “The Perfect Scent: A Year Inside The Perfume Industry in Paris and New York” by Chandler Burr. Mr. Burr had the enviable job of being a reporter for the New York Times Style Magazine whose beat was the perfume industry. He is now Curator of the Department of Olfactory at the Museum of Arts and Design in New York City. The only curator of olfactory art in the world. The book follows the inspiration and creation of two perfumes, one in-house at Hermes pronounced by Burr as a true artist perfume designer, the other created for and inspired by actress Sarah Jessica Parker. The former meant to highlight a more artistic approach to perfume design, and the latter a more commercial approach. I believe both are examples of highly commercial processes dependent on the art of perfume design with entirely different audiences. This is a scent for a woman who has no taste and absolutely no interest in having any. This is for a woman who loves a man who wears Vile and Toasty. She lives in an apartment without light or furnishings or running water or, perhaps oxygen, and she sleeps inside an aluminum container in a frozen green goo. Spoken like a true arbiter of fine anything. This reminds me of reading old critics and curators of “modern art” – a time where distaste and opinion were on the front, and pleasing people or certain audiences was on the back burner. I applaud Burr’s honesty and candidness. Wishing for the same to enter into the visual arts venues. The scent of Coppertone is incredibly well made, is beautifully composed. Call it a work of design—call it what you will—it is a minor work of art. While fine art has never really embraced scent as a medium, I know there have been fragrances designed with artists and a small number of works that included scent. I’m seeing its time as rising, since its such an evocative medium – one of the fastest to illicit memories. It’s definitely on my radar. Back in the day when I was writing strategic business plans for new businesses I was introduced to a high tech fragrance company. The company’s target audience and hardware were fascinating – another post entirely. Meanwhile for the scent curious and New York-based, check out the exhibit Chandler Burr has curated, The Art of Scent: 1889 a 2012 through February 24, 2013 at Museum of Arts and Design. While I have drawn some parallels to the visual arts, it’s really, really, really important to note the funders of this scent exhibit are Estée Lauder, Hermes, Guerlain, Loreal, P&G Prestige and Dyptique. Kind of like a show called “Wonderful Art: An Important Review” at the Museum of Modern Art anywhere funded by Damion Hirst, Gerhard Richter and Gagosian Galleries. You get the drift. 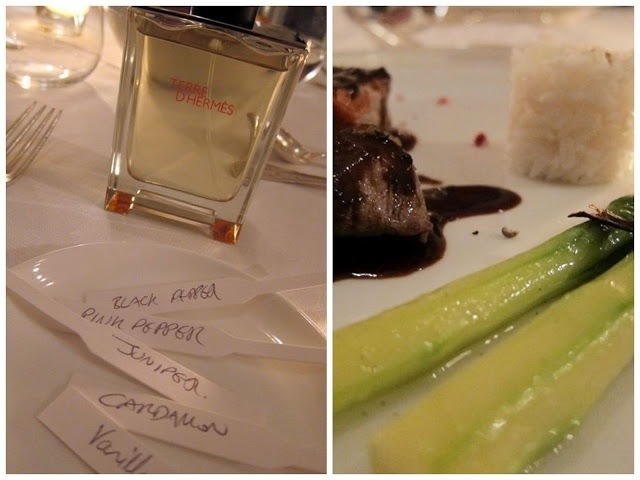 Image from a Scent Dinner hosted by Hermes and Burr in Rome, courtesy of Elizabeth Minchilli In Rome web site.